After breakfast we pedal down to Vival and the boulangerie for a bit of shopping and buy dried apricots and pizzas there. It is market day so while we are parked we deal with a few inevitable ATQs. Then we return via Rue Basse to post our postcards and head back to the bridge to pick up our downward run where we left it yesterday. The road is small, verging on non-existent but is a pleasant lane. It takes us under the Chamborigaud railway viaduct. Chamborigaud is not famous for a lot so this viaduct features on all their postcards. It is quite impressive and probably was as much admired in the nineteenth century as the Millau viaduct is today. The lane takes us through someone’s front porch on a short section with two speed bumps and a 10kph speed limit. We are following the small River Luech valley so the road continues to have a very satisfactory downward tendency. There are patches of new gravillon repairs, but no real problems. As we go on the road widens out and even here on this minor road the improvers have been at work hacking lumps of cliff away to widen the road. We pass through Peyremale and the larger town of Bessèges where we cross to the other side of the river still on our downward journey. At Clet there is a rather nasty large new bypass, which we have to follow because the old road has been physically blocked. It does have a wide cycle lane, however, and we quickly whizz round it on its downhill curve. From here it is a short distance to St Ambroix where our downhill run finally ends, 52kms from the Col de la Croix de Berthel. We enter St Ambroix over the main road bridge. The town is remarkably busy for a Sunday morning. John decides to take us on a short tour of the historic town without quite knowing where he is going. Sheila is more interested in the cafés that John has ignored on the way. We end up back in the main car park, where it is remarkably difficult to find a spot to park the trike so that we can supervise it while sitting on a bench to eat our PaRs. That done we make a short distance transfer to a café for coffees. Sheila uses the toilet and comes back with a lurid description of the café’s interior all finished in crushed red shiny metallic ‘paper’. Our way out of town is back over the bridge and then on to a small road. 13 years ago when we first did this tour the road to Barjac was hot, dusty, busy and none too pleasant. We figure that it won’t have improved in the intervening years, so Sheila has plotted an alternative and shorter route on small roads over the causse. This has potential, like some of Sheila’s other direct cross country routes, to be very hilly, but there is an opt out road part way so we agree to give it a go. Needless to say we start off climbing. The road is certainly up and down (mostly up) but it is manageable and the views out across the valley are very good. It is not busy, but we are still surprised how many cars go by on a road that essentially goes to nowhere. Leastways nowhere with a population of more than twenty people. Our conclusion is that either it is just an interesting Sunday ride to take the sports car along, or there is a wedding on today somewhere up in the hills, or there is a particularly good restaurant tucked away in some rural spot to which all are heading for Sunday lunch. Looking at the mix of cars on the road we decide that the Sunday lunch theory has it. Having expended all of our energy climbing we turn onto a slightly larger (less small really) well surfaced road and are rewarded with a well-graded downhill run for about 6km to reach Barjac. We take the new bypass around Barjac, but on reflection it would not have required much more effort to climb into the town and go through the centre and this would have been more interesting. From Barjac there is a solid ridge of countryside to climb over. It is no harder than many other climbs, but somehow being a wide and dead straight road makes it seem further and higher than it probably is. Over the top we turn off the road into Vagnas and find a shady spot by the church for our picnic lunch. The tabac does not sell cans of drink and the bar / café does not look too inviting on the main road, so we decide to press on to Vallon Pont d’Arc and stop there for a drink. Some of the widened roads we have been on are marked out with very clear and generous cycle lanes on which even with the 1m wide trike we can cycle along well away from passing traffic. It is downhill into the centre of Vallon Pont d’Arc, but in the centre we become trapped by pedestrianised streets and a one-way system. John walks part way along a pedestrianised street to see if we could get through, but it is very crowded with trippers and would be impossible to push the trike through. Also Vallon has not improved since we were last here. It was full of tourist tat then, and still is today – or more so. We decide it is a town better avoided than visited and seek to escape. Unfortunately the entire one-way road system is designed to take any vehicle trapped within it to one of the vast edge of town car parks. We comply and then double back outside the town on a long circuit so as to retrace uphill the way we had first approached the town. We make a mental note not to put VPdA on our recommend list and agree with Michelin for not giving it even the lowest category of ‘worth a visit’. 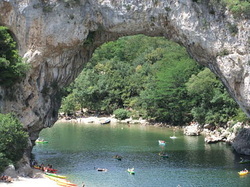 Freed from the town we turn to start along the Ardèche gorge. The road is quite busy with cars and free shuttle buses running between Vallon and Pont d’Arc itself. We pass a new large visitor centre and car park for Pont d’Arc. This is still quite a way from the site itself and we wonder if all the tourists stopping there realise just how far they have to walk on the new footpath along the gorge. The good thing is it captures nearly all the traffic and we are on a fairly quiet road itself. When we reach Pont d’Arc we cruise to the roadside verge to take in the view, being free from the ‘no stopping / no parking’ strictures on other vehicles. There is no doubt that, popular as it is, the huge rock arch with canoes bobbing around beneath in the sunshine is a two star site. It is a short distance on from here to our Logis hotel. We check in, park the trike in the backyard and find our room for S&W. While in the bathroom we take photos of each other in the ‘naughty corner’. It is Stage 2 of TdF so we lie on the bed and watch some of the team time trials (won by Garmin-Cervelo), before taking ourselves down to enjoy the hotel pool. This will be the last one of the holiday so it is good to have the afternoon sun while we float about in the pool or laze at the poolside. Later we have drinks on the terrace and also eat dinner there.